Facing a difficult challenge? You want/need to spur students to self-assess to achieve greater learning? In this blog entry, you will learn six exciting strategies based on G Suites tools that can help to motivate us to accomplish more. You can also visit Peggy Reimers’ companion website to see examples in action. Students with opportunities to self-assess believe they impact their own learning. Students will attribute their success to their own learning, effort, and study. Per research, this means several things. One, students “develop internal attributions, a feeling of empowerment.” Two, they develop “a sense of autonomy” (source). These are the same feelings that empower adult learners. Several ways exist to encourage students to self-assess and reflect. One is to provide them with tools. Another involves having them create their own tools. With G Suites, have students create self-graded quizzes for themselves and others. Each collaborative group of students can create a quiz. This quiz can be about a jigsawed piece of content. These quizzes they create are helpful in and of themselves in that they can be used as an exit ticket for other groups. Empower students in various groups to prepare and complete quizzes. Set up a class leaderboard to capture success. Wait, can’t I go low-tech, too? Don’t want to use G Suites tools for everything? Waco ISD’s Assistant Director of Technology, Lisa Monthie, shared these low-tech strategies: 3-2-1 Summary, Careless Clueless via Lead4ward, QR Codes MatchUp, Stars and Steps Chart, and Twitter Ticket. How can student show they’ve learned something? It could be a way that has them synthesize data and information. Their proof might include finding new ways to apply that learning. Another involves facilitating reflection on how they have grown. How do you achieve these? A fellow edublogger has a specific suggestion to address these challenges. “It is not the reader of a text who learns the most,” says Stephen Knudsen, “but rather the author. When a student makes a textbook in a course, the student engages daily in all classifications of learning. When students make a textbook, they must remember, understand, apply, analyze, evaluate and create. The results of this process are often nothing short of astonishing!” Read this TCEA blog entry on creating a digital textbook. Students have access to a wide variety of copyright-friendly media. You can broaden student awareness of these with multimedia text sets (MMTSs). These present a wide variety of specific resources around a focused topic. Students can work through an MMTS or choice board to gain a deeper knowledge of what works. Top image search sites, from Pexels and Pixabay to UnSplash rely on Creative Commons to share. These shared images provide the raw, albeit distinctive, graphics students can use. You can use Google Docs with its built-in ePub export tool or Google Slides. The latter features inserting an image via Google’s built-in search. Students can storyboard/outline and then create. Afterwards, they can share their ebooks. You can embed your students’ G Suite files (i.e. Docs/Slides) into a new Google Sites location. Push students to create their own digital textbooks or capture learning for a unit of study. Creating ebooks has never been easier with the addition of new tools. If you haven’t kept up to date, you’ll want to read this blog entry. It demystifies key elements. Those include locating ebooks, ebook formats, converting eBooks, and creating ebooks. I also share more sources of copyright-safe media. Read the blog entry. Need some more copyright-safe media? Check out this short list of image, audio, and video content locations. Students work to organize information in logical ways. It empowers students to display their content knowledge in various ways. It develops and strengthens critical thinking skills. An infographic gallery can serve as a repository for public service announcements (PSAs). Each PSA can challenge conventional thought and encourage civic responsibility. Organize your PSAs in Google Photos. Read more about this approach in my Infographics Made Simple blog series. Be sure to check out the companion website. Use Google Slides/Drawings with Thinglink to create interactive posters on current events. In Google Slides/Drawing, students can create a digital poster or infographic. Then, using Thinglink’s hidden icons, students can create a challenge for poster viewers. You could present a challenge to students that involves finding a revealing fact or insightful idea. Using hidden icons, or hyperlinks embedded in Google Slides/Drawings objects, offer more. The “more” could be a link to contradictory or less than common perspective. Did you know that the most engaging animated GIFs contain faces and motion energy? The more a GIF’s images enjoy uniformity, resolution, and consistent frame rate, the more engaging they are. Animated GIFs are “more engaging than text, photos, and videos” according to research. This make creating them a priority for students and educators who want to engage others. Have students create animated GIFs conveying critical facts. An alternate approach may have them suggest points of view that have changed over time. One challenge you can use involves G Suites version history. Read more about it in this blog entry, Making Animated GIFs with Google Drawings. Do your students see a real-life problem in the community? Have them trace its history and develop a comic slide show. Students can take pictures of each other in character to capture the issue. One approach might be to find past issues in the community or of historical interest. Then, have students take pictures of students impersonating a stakeholder role. Students would appear in costume. After students take photos, they add speech bubbles in Google Drawings or Slides. You can share the photo slideshow as is or create a screencast and then share it as a video via YouTube or Google Drive. Challenge students to capture the past perspective from historical information. 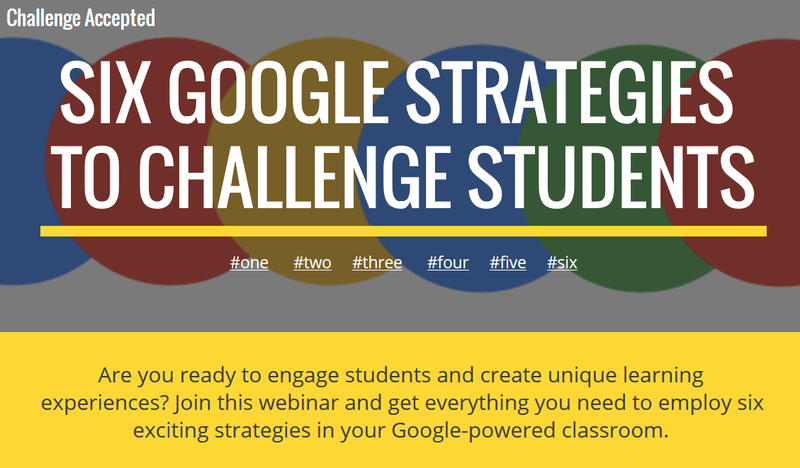 These are only six of the many ways you can use Google to challenge student thinking. Push for inquiry-based projects that put students in the driver’s seat for creativity. They won’t disappoint you.